Healthy Shrimp Fettuccine can be on your table in 10 minutes. 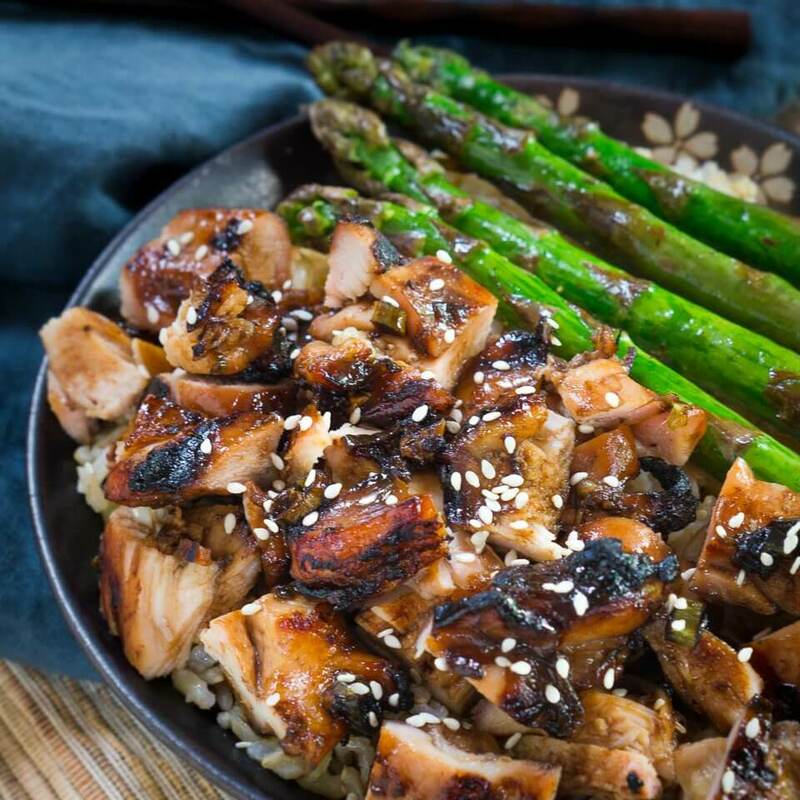 This recipe proves that you can put a dish on your table that is quick, healthy and delicious. 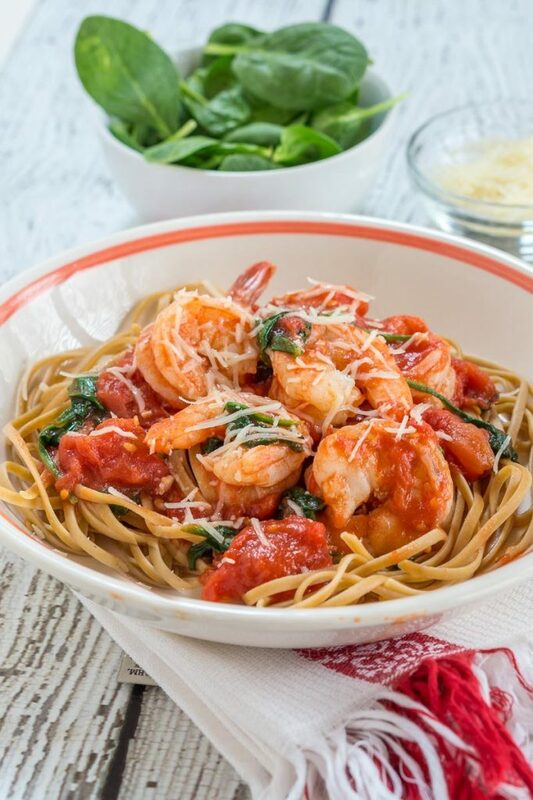 When you eat Healthy Shrimp Fettuccine, the last thing that you think of is how healthy it really is. There is nothing missing from this delicious dish except for the extra fat and calories. You guys know what an influence my grandmother was in my love for cooking and baking right? It was so much more than the food she made. It was about the conversations that we had and the gentle guidance she provided without criticism. One thing I’ve never shared is that she passed away relatively young from a sudden heart attack. The food she made was warm and comforting not to mention delicious. A lot of dishes started with a spoonful of lard from the container she kept on the stove. If there was any grease left from a pan it got poured into that container. When I say grease, it was basically animal fat from bacon or other fried foods. We know so much more today, and if we choose, can eat much healthier. Just knowing that I have heart disease in my family inspires me to follow a healthy diet (most of the time) and exercise regularly. Eating healthy isn’t difficult and can be quick and delicious too. 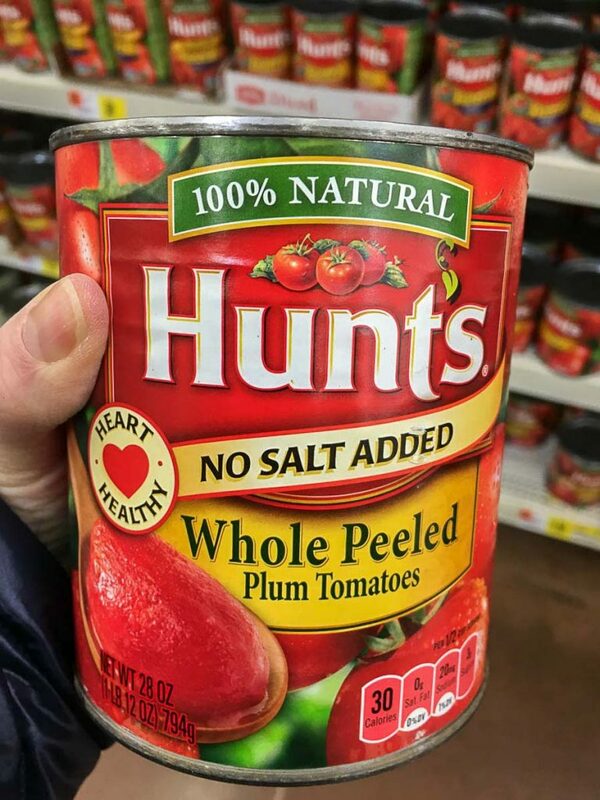 I use Hunt’s Tomatoes all the time. In this recipe, I used their Whole, Peeled, No-Salt Added Plum Tomatoes. Hunt’s No-Salt Added Plum Tomatoes so I can control the amount of sodium in this recipe. Herbs for flavor instead of a lot of salt. Shrimp is a lean protein. Fresh spinach is packed with good for you vitamins and antioxidants. Whole wheat fettuccine noodles added whole grains and fiber. Eating meals like this is not a sacrifice or a “diet food” that leaves you hungry before you’ve left the dinner table. It’s beautiful food that I would be proud to serve to guests. In a large skillet, add Hunt's Whole Peeled Plum tomatoes and juice. 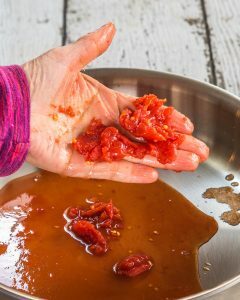 Using your hand, crush each tomato into large pieces. Cook over medium heat until juice is reduced by half, about 5 minutes. 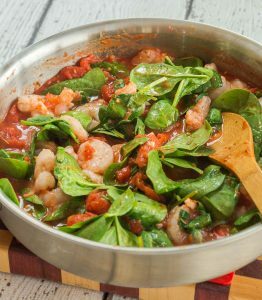 Add minced garlic, crushed red pepper, spinach and shrimp. Cook an additional 5 minutes, stirring to combine. Salt and pepper according to tastes. Serve over cooked Fettuccine pasta and garnish lightly with parmesan cheese. Another thing about my grandmother was that she was frugal as were a lot of people in that era. This Shrimp Fettuccine dish is a very reasonably priced meal to make and I love that! 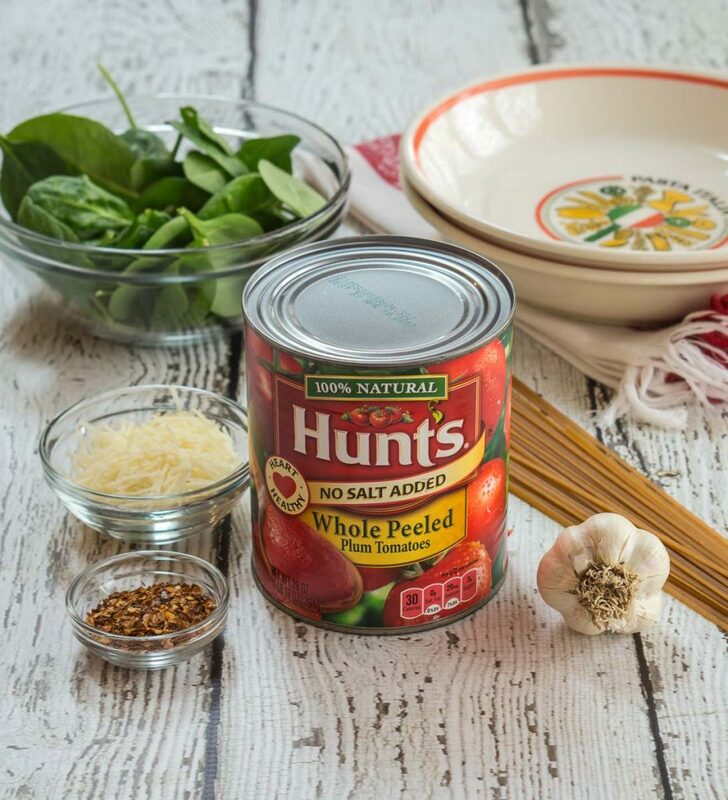 February is American Heart Month, and you can find out more about Hunt’s Tomatoes support of the American Heart Association, as well as pick up some more great recipes. These products and the education that we have may prevent others from developing heart disease. 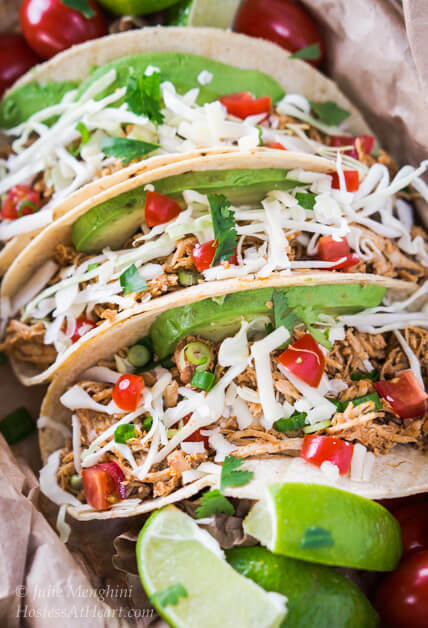 Here are a couple more healthy meals that taste great! Thank you so much! We seriously loved it and I hope you will too! Great recipe, I find those bags of baby greens (kale, spinach, or a mix) so convenient for adding extra nutrition. I’ve been adding them to everything…soup, stir fries, and pasta sauces. Thank you Liz! I need to use them in stir fried! What a beautiful recipe, Julie! And I just love the whole layout of the post! Thank you, Mollie that is so sweet! I hope you had a wonderful weekend! I’m a big pasta-lover, and I love lighter, healthy pasta dishes like this! Ooooh, looks delicious and we have fresh shrimp available every day on the Baja. We don’t have canned tomatoes but fresh plum tomatoes should be great. Oh, Tracey, I would love to have access to fresh shrimp or seafood for that matter! Thank you for such sweet comments! Healthy and delicious…that is what I call “smart cooking”. Thank you Karen! It is so easy and you wouldn’t ever know it. Thank you Zeba! I really appreciate you hosting FF this week too! My husband doesn’t like tomatoes unless they are a smooth sauce. Anything else I can add. You can use tomato sauce then Kathie. What a coincidence. I just picked up some beautiful shrimp and a package of pasta. Guess it’s a sign, I know what we’re having for dinner! I’m am channeling good dinner karma your way Beth! Thank you and let me know what you think. Thank you Amber! It is so good and who knew it was so easy to put together? Thank you for stopping by! I love quick pasta dishes! 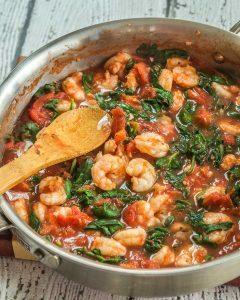 I am not a fan of shrimp, so I think I will try this with chicken. Thanks for sharing! Thank you, Antonia! You could totally do this with chicken and it would be delicious too! I love my shrimps as evident by the number of posts I have. I frequently buy the “no-salt” tomatoes especially when there are other seasonings such as Italian. I need to use whole wheat pasta more – normally I cook the half and half mixture but with a tomato sauce it masks the nutty flavor of the pasta. Spinach is a good addition – I’m not into greens a lot but spinach, most definitely. 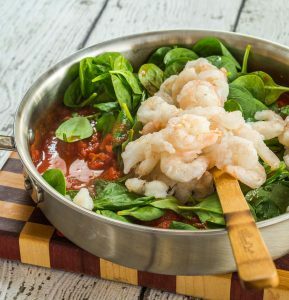 I’m a shrimp lover too Judi and like spinach as my greens too. I haven’t fallen for kale yet but sure wish I did. I make a lot of our pasta but when I buy it I try and get the wheat pasta. Try removing the hard stems from kale and freezing it. Use it in a liquid like orange juice in a blender for smoothies. It blends nicely when frozen and you can’t taste it when blended with other ingredients. Thank you Margie! That sounds like a wonderful choice. Thank you Maria! We love simple dishes like this too! 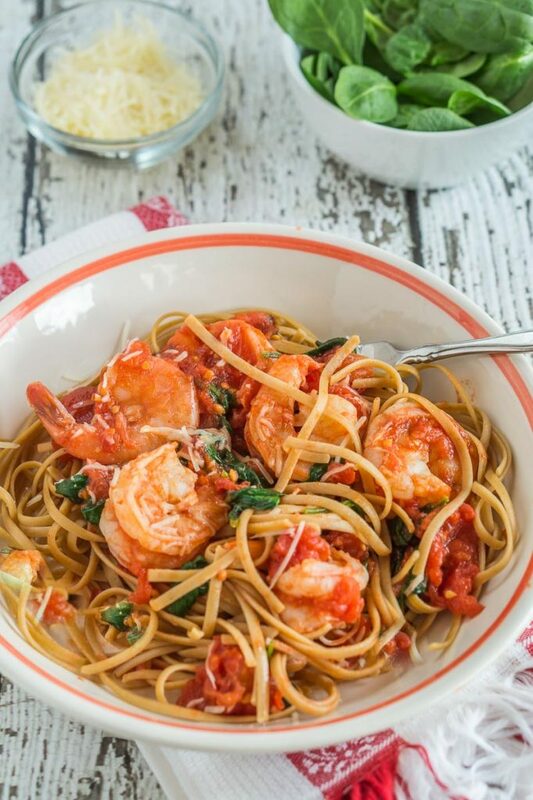 You must be reading my mind as I’ve been craving a shrimp and pasta dish! Looks delish!